Readers with some passing knowledge of literature might be startled by reading in The Three Musketeers a passage in which D’Artagnan refers to Gulliver’s travels more than a hundred years Jonathan Swift invented them. Dumas had got it wrong. On the other hand, no one came nearer to getting it right than Patrick O’Brian, whose seafaring novels provide without warning the intricacies of a ‘snow’ and a ‘xebec’ and the practices of gammoning and warping the futtocks, details that tend to overshadow the writing that brought such terms our way. The Three Musketeers is undeniably a classic; The Wine Dark Sea is the subject of much (unfair) criticism for burying a good story in unnecessary historical details. Is there a line of how much is ‘just right’ in research and story telling for historical fiction? If there is, how does a writer get on and stay on the right side of it? Historical fiction is the land of maps, mistresses, and Machiavelli. It is a place where Newton’s laws of physics and Freud’s principles of human behavior are the breeding grounds for conflict. It is no exaggeration to suggest that bodies set in motion tend to stay in motion, particularly if they are in a bed behind a throne. 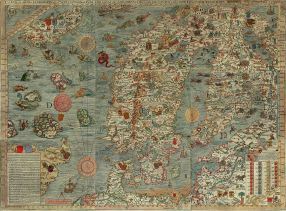 Maps lead to treasure or mislead to disaster. As we learn from The Prince, it is in the nature of mankind to hate others more for their good deeds than their misdeeds, to despair more from the loss of an inheritance than the loss of a father. With so much conflict at hand, how does one approach research for historical fiction? Before addressing methods of research, consider some cornerstones. First, someone will know more about your subject than you do. D’Artagnan’s malaprop is not an isolated blunder. I recently read a chapter in which a field surgeon raced to a wounded soldier and administered penicillin – in 1917, ten years before Dr. Fleming discovered it. Accordingly, a first consideration is the degree to which a reader who picked up your book because s/he has particular interest in your subject may put your book away without finishing it because of historical inaccuracy. If the story claims accuracy, it must be accurate. If the story is a tale, a slide in the facts may be forgivable. But there is someone who will spot the mistakes, and the more mistakes there are, the harder the story becomes to read. Second, some inaccurate details might well be more historical than the truth. No submariner in his right mind would ever smoke while loading a torpedo, but boys might well smoke stolen Lucky Strikes because they believed a magazine advertisement that said their heroes smoked Luckies to calm their nerves. The distinction here is one not of accuracy but of veritas. To write about boys smoking a brand for the wrong reason is a detail that is right because it is so wrong –everyone can envision boys smoking Luckies because of a cigarette ad, even one as outlandish as the inhaling submariners. A Life magazine from the 1940’s may not be reliable history for scholars, but is definitely a reliable source of what people did and thought in their everyday lives at the time. A third point to keep in mind is that exceptional research cannot replace good story telling. After once having spent days poring over construction blueprints for landing ships, I eventually proofread my manuscript and discovered that I had written ‘He stood at the bow doors that were suspended laterally by four roller-drum barrel hinges each six inches in length and with a load-bearing capacity of ….’ Great research, awful story telling. (This might be a good place to mention The Da Vinci Code). Fourth, a corollary to the third, is that good writing can overcome doubtful research. (Ask Alexandre Dumas). How? The historical story, or novel, operates on at least two levels. As history, the background details must be based on facts or, in the complete absence of accepted facts, on a compelling mosaic of background details that are themselves accepted. For example, it is indisputable that Katherine Swynford had a long (and productive) affair with John of Gaunt but it is not known how they met. By piecing together very sketchy details about Katherine with known details about John, Anya Seton wrote a very credible tale about how the two were thrown together. She did what would become the mantra of Hilary Mantel: question every historical fact you think you know and never accept as final anything taken from only one source of reference. What you learn in the process can take your story to a very high level. On the second level, the novel as storytelling, the story should operate as complete fiction. The research should ease the readers’ acceptance of the story’s internal truths, despite the fact that the story is not true. For example, the Count of Monte Cristo escaped from the Chateau d’If, (as did Tom and Huck’s friend Jim). The internal truth requires the reader to believe not only that it was possible, but actually happened. Dumas’ research into the thickness of rock walls, habits of guards, and height above pounding waves made his tale of fictitious escapes believable. The external truth is that no one ever succeeding in escaping from Chateau d’If, but the story was so credible that no one questioned whether anything like it had ever happened. The main point is that good research and good writing can make for exceptional fiction but cutting corners or assuming the correctness of a fact can lead one off the edge of the map where, as all historians know, there be monsters. Next, in Part Two: Some thoughts on how to do research for historical fiction. See you then.